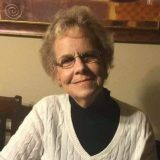 Shirley Chaffin Down Cork, 80, of Denton, Texas, went to be with the Lord on June 10, 2017. She was born in the Cypress community of East Texas before moving to Winnsboro where she attended Winnsboro High School before moving to Dallas with her family. She was a lifetime member of VFW Post 2205. Shirley was preceded in death by her parents, Edgar and Pearl Chaffin, 13 brothers and sisters and husbands Kenneth Hicks, Les Cerny and Harold Down. She is survived by her husband DeLoyd (Dee) Cork of Denton, son Curt Hicks of Belize, daughters Carla Hicks Jacobs of Ft. Worth, Connie Hicks Watkins (Ed) of Denton and Jill Cerny Carter of Denton; stepson Jason Cork, stepdaughters Carol Casey (Shannon), Tisha Deck (A.C.) and Crystal Cork. She is also survived by grandchildren Christopher Morris(Brandi), Cory Norman (Shannin), Nicholas Norman, Colby Jacobs(Rachelle), Callie Jacobs Oellrich (Stacey), Peggy Jacobs de Rodas (Joel), Dakota Hicks, Jade Akins, Dana Akins, Heather Ingle, Ashley Hollier, Kortney Hicks, Brandon Schweers, Kristi Schweers, Aidan and Aslynn Valls; as well as great-grandchildren Phoenix and Wren Morris, Ethan Norman, Ryley Norman, Harper Jacobs, Gabriela Rodas Jacobs, Logan and Lacey Schweers and Payton Ramirez.